What’s Driving Clashes Between Ethiopia’s Somali, Oromia Regions? Somaliland, a semi-autonomous region in the Horn of Africa, has displaced thousands of ethnic Oromos, according to Negeri Lencho, Ethiopia’s information minister. The forced relocations are the latest fallout of simmering conflict along the border between Ethiopia’s Oromia and Somali regions. Those tensions have boiled over in recent weeks, resulting in hundreds of deaths and tens of thousands of displacements, Lencho told reporters at a press conference on Monday. The conflicts are the latest in a series of clashes that have ebbed and flowed for over 25 years. Some of the root causes remain unchanged, but new dynamics, including increased militia activity in the region and escalating tensions make solutions more elusive. Oromia and Somali share Ethiopia’s longest interior border, a meandering line from Moyale in the south to Mulu in the east. Parts of the border follow the Ganale Doria River, but the regional boundary mostly stretches between the Oromia grasslands and Somali desert. A common way of life has long connected Oromo and Somali people. The Oromia and Somali regions share language, religion and culture. In fact, some groups who speak the Oromo language identify as Somalis, and vice versa. Despite these close relations, the two ethnic groups have experienced intermittent conflicts over resources, including land and water, over the past 25 years. The tensions date back to the formation of Ethiopia’s unique brand of ethnic federalism. In 1991, politicians divided the country’s population — nearly 50 million people at the time — into nine regional states based, in large measure, on ethnicity. 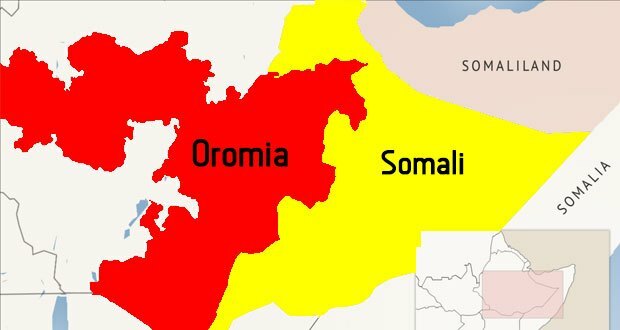 Disagreements over exactly where the Oromia-Somali border should lie have resulted in several referenda, but full demarcation has never occurred, contributing to ongoing strains. The border has great symbolic power: More than just an administrative boundary, it’s tied to identity — a political and ethnic differentiator between Ethiopia’s two largest regions. Frictions along the border have been longstanding, but recent conflicts have taken a new, more ominous turn, experts on the region, including Human Rights Watch, say. Exactly who’s behind the recent killings and displacements isn’t clear, however, even from within the country. Spokespeople from each regional government blame armed groups from the other side. “We here in Ethiopia are also confused. It’s not easy to understand what’s going on with this long border,” said Fekadu Adugna, an assistant professor of social anthropology at Addis Ababa University. Much of the confusion stems from the complex assortment of federal, regional, paramilitary and rebel groups engaged in armed conflict across Ethiopia. The Liyu police, a special police force based in Somali, have been accused of killing people in the Oromo ethnic group. But the Liyu have also fought the Ogaden National Liberation Front, a separatist faction that seeks self-rule for Somalis. Limited access to the conflict zones makes it difficult to prove accusations of who is behind the current attacks. “A number of people have lost their lives,” Adugna said. But, in many cases, the exact circumstances of their deaths remain unclear. Ethiopia’s powerful federal government, rather than controlling the conflict, has only fanned the flames of the ethnic division, according to some observers. Felix Horne, a researcher with Human Rights Watch focused on the Horn of Africa, said Ethiopians interviewed by HRW have long felt bullied by the federal government. Protests across Ethiopia roiled the country in 2016, resulting in a 10-month state of emergency and a concerted government crackdown that began last October. The protests began when the government proposed expanding the boundaries of Addis Ababa, Ethiopia’s capital, into Oromia. Hundreds died as unrest swept across the Oromia and Amhara regions. Horne said the state of emergency silenced protesters without addressing their true concerns about land rights, political representation and freedom of expression, setting the stage for the most recent violence. The state of emergency did stop protests and associated violence, said Margaux Pinaud, a researcher on political violence in Africa with the Armed Conflict Location and Event Dataset, a body that produces real-time data for disaggregated conflict analysis and mapping. Increases in militant activity could suggest an escalation of the people’s movement, she said. That movement has increasingly become an armed struggle over grievances with the federal government, which many Ethiopians say doesn’t represent their interests. Protesters previously committed to nonviolent resistance haven’t produced results, Horne said. “There’s lots of discussions about different options, which is obviously really, really worrying,” he added. Professor Adugna said the root of the conflict lies in a volatile combination: the symbolic meaning given the Oromia-Somali border, and its lack of an official demarcation. The solution includes two parts, he said: Physically demarcate the border as soon as possible, and de-emphasize its significance. For this to work, he said people must be allowed to move freely from one side of the border to the other. Pastoral movement, in particular, should not be hindered since nomadic societies occupy both regions, particularly on the Somali side. Equally important, Adugna said, people impacted by conflict, especially historically disenfranchised groups, should be consulted in the demarcation process. Those groups include the Oromo who, despite being the country’s largest ethnic group, have enjoyed little political power under Ethiopia’s form of ethnic federalism. Religious leaders, not politicians, should guide the process, he said. In the end, he said people want to live in peace. That in turn will enable a solution to the decades-old tensions that reached new heights in recent weeks.